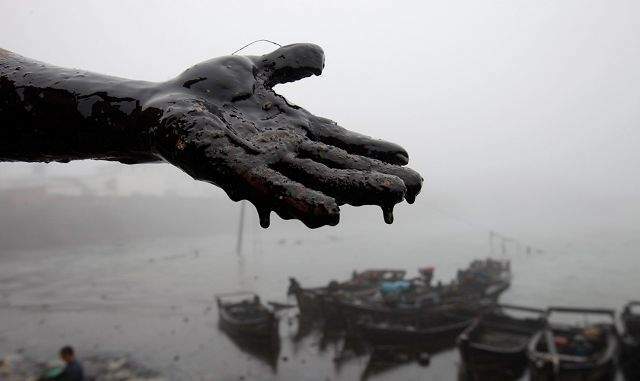 A villager displays his hand coated in crude oil during cleanup efforts almost a week after a pipeline, owned by China Nation Petroleum Corp., exploded in northeastern China. BEIJING  China and environmental observers said cleanup efforts on the countrys largest reported oil spill were progressing Thursday, but the environmental and economic damage was clear. The cleanup  marred by the drowning of a worker this week, his body coated in crude  continued over a 165 square mile stretch of the Yellow Sea off the northeastern city of Dalian, one of Chinas major ports and strategic oil reserve sites. China National Petroleum Corp. said Thursday that the pipeline that exploded and caused the oil spill last Friday had resumed operations. The blast had reduced oil shipments from part of Chinas strategic oil reserves to the rest of the country. The cause of the explosion that started the spill was still not clear. The company, Asias biggest oil-and-gas producer by volume, also said more than 400 tons of oil had been cleaned up by 9 a.m. Wednesday, according to a posting on its website. The environmental group Greenpeace China released photos Thursday oflocal fishermen cleaning up oily sludge at Weitang Bay with shovels, and of an employee scooping up dead snails at Guotai Water Products Farm, about a half of a mile from the site of the explosion and spill. Dalians seafood farming and tourism industries have taken critical hits, Greenpeace China said in a statement. It estimated 10,000 shellfish farms have been contaminated. Greenpeace China also saw progress in the cleanup at Jinshitan, one of Dalians most popular beaches. The Dalian Daily newspaper cited an official in charge of cleanup efforts as saying the polluted area was shrinking, but no update on the spill size was issued Thursday. It remained unclear exactly how much oil has spilled, but state media has said no more is leaking into the sea. China Central Television earlier reported an estimate of 1,500 tons of oil has spilled. That would amount roughly to 400,000 gallons  as compared with 94 million to 184 million gallons in the BP oil spill off the U.S. coast. The ecological harm from the spill could last a decade, Zhao Zhangyuan, a researcher with the China Environmental Science Research Institute, told the Shanghai Morning News earlier this week. The most critical is the effect on people, the effect on health, Zhao said, because the decomposing oil will produce some carcinogenic substances that could move along the food chain to humans.